Chimney maintenance and cleaning is an essential part of many individuals homeownership. Most of the time, a simple maintenance cleaning only requires a professional to sweep the chimney “traditionally” with the use of a brush. However, to ensure that your chimney remains free from any build up, it is advised that you have a deep power sweep performed on your chimney at least once a year. Chimneys which are used more often should have a power sweep 2 to 4 times a year. Where there is nothing wrong with a brush sweep on your chimney, in fact SM Sweeps encourage you to have this service performed regularly; it cannot get all the materials which build up in the chimney. If your chimney is mortar and brick, then soot and tar can accumulate within the small holes of the mortar. Cleaning with a brush may remove a great deal of the soot, but the brush may also push soot into these small spaces as well. A power sweep is designed to get all the soot and debris cleared from the chimney. Because a power sweep is based upon the use of various powered tools, the flume gets deeper cleaning. Where a brush cleaning uses primarily an up and down motion, the power sweep uses a revolving and upward pushing motion to clear the chimney. How does power sweeping work? Power sweeping is a method of cleaning the chimney from the ground up. Dependent upon the blockage and build up in the chimney, the cleaner may have to perform the cleaning using a series of brushes. These brushes are attached to a power driver or other such device which causes the brush to rotate as it is pushed upwards. At the same time, a shop vacuum or similar device is working to remove the soot and debris as it is cleared away by the brush. The brush is pushed up the length of the chimney and exits the top. Once this is done, the cleaner performs the same process just in reverse, pulling down the brush instead of pushing up and removing segments as needed until the brush is at the base of the chimney. What debris is typically removed with a power cleaning? Power cleaning is generally used to remove soot build up. However, it is also common that a power sweep be used to remove tar build up and other materials which may be blocking the chimney (such as abandoned birds’ nests). Blocked chimneys present a fire hazard and therefore it is paramount that the debris be removed efficiently. It is advised that if you have tar build up, that you seek not only a power cleaning, but specific tar cleaning services to ensure the safety of your home. Power cleaning also rids your chimney of Creosotes which are extremely harmful. Creosotes typically have carbon and other chemicals which can pose a fire risk if they accumulate on the chimney. As there are over 6,000 chimney fires a year (with the majority due to soot, tar, and creosote build up) having your chimney power swept is a crucial part to the maintenance of your home. Because power sweeping incorporates power tools and techniques, it is unadvised to attempt to perform a power sweep on your own. Improper use of brushes, power tools, and other equipment used by chimney sweepers can cause damage to your chimney. This is especially true in chimneys which are constructed of “thinner” material such as aluminium which can easily become punctured if not cleaned properly. Any flume which becomes damaged can cause smoke build up in the home, a chimney fire, or structural damage to the chimney and home. Hiring a professional and licensed sweeper will ensure that you get the cleaning services that you need from someone that has experience in doing so. In many instances, the chimney sweeper can perform the cleaning of your chimney while you wait. You do not have to feel insecure in having someone in your home because the work is done while you are present. Plus, when hiring a professional with a strong reputation, you ensure that you are getting top quality work. Your chimney is a vital part to your residence. 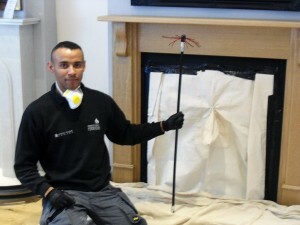 If you have not had your chimney serviced, cleaned, or maintained this year, we would like to offer our services to you. Our team of professionals will ensure that your chimney is cleaned in a professional manner to minimize the risk of safety, health, or structural issues which can be cause from an unmaintained chimney. If you have any enquires as to the power sweep cleaning process or if you would like to enquire about any of the chimney cleaning services we offer, we would love to hear from you. SM Sweeps are here to help.